Abandoned pets and plants which are released into the wild have become a serious invasive species threat. According to the Invasive Species of Idaho website, some of the most notorious invasive species in the United States were originally sold as pets or plants for gardens and aquariums. When purchasing a pet the owner must consider the entire-life cycle before buying or adopting. If an owner can no longer care for the pet, and it is a listed invasive species, call the Idaho Invasive Species Hotline at 1-800-336-8676 for re-homing options. Clean — Whenever leaving any body of water always inspect equipment, that includes boats, trailers, scuba gear and lures, for any visible plants and animals. Check all places that are still damp. Dispose of removed material in the trash or on high, dry ground where there is no danger of it washing into a body of water. Drain — Eliminate water from all equipment, including motors, wakeboard ballast tanks, boat hulls, scuba gear, waders and boots. Dry — Clean and dry anything that came in contact with water, including boats, trailers, clothing and pets. The goal is to make any possible invasive specie dry out. For more info you can go to invasivespecies.idaho.gov. TWIN FALLS – A bubble-gum pink substance rests on a branch. It’s completely foreign to the 10-mile stretch of river surveyed July 24 during an annual survey. These alien-like pink bubbles are apple snail eggs. Apple snails are mollusks from South America introduced through aquaculture trade. The eggs are unpalatable to predators, which can lead to an overabundance of the species. “Gosh dang it, Darwinism,” Jason Parker joked. The apple snails were just one of the many invasive species and noxious weeds found during the yearly survey of the river. Invasive species are classified as animals or plants that are not native to an area. The invasive species outgrow and out-compete native species and dominate an ecosystem because these new species don’t have a natural predator. Ursenbach and Parker were part of the team that surveyed the 10-mile stretch of river to inspect what noxious weeds were prevalent. Idaho has 67 noxious weed species; 16 of these are aquatic plants. These plants often thrive in warmer waters and have the potential to damage. Aquatic noxious weeds can build up and stop the flow of streams and damage pipes, which can cost millions of dollars. During the survey, Hydrilla verticillata was repeatedly found. Ursenbach and his invasive species team go through streams every week and pull out Hydrilla verticillata. Idaho law says it’s the duty and responsibility fall on landowners to control noxious weeds on their property. Jeremy Varley, the Idaho Department of Agriculture section manager for noxious weeds, said that the best resource for landowners who don’t know what to do with noxious weeds growing on their property is to contact their county weed superintendent to point them in the right direction. A large threat to ecosystems is quagga and zebra mussels. These mussels clog water pipes and other infrastructure. They eat plankton in the water which threatens the entire ecosystem. 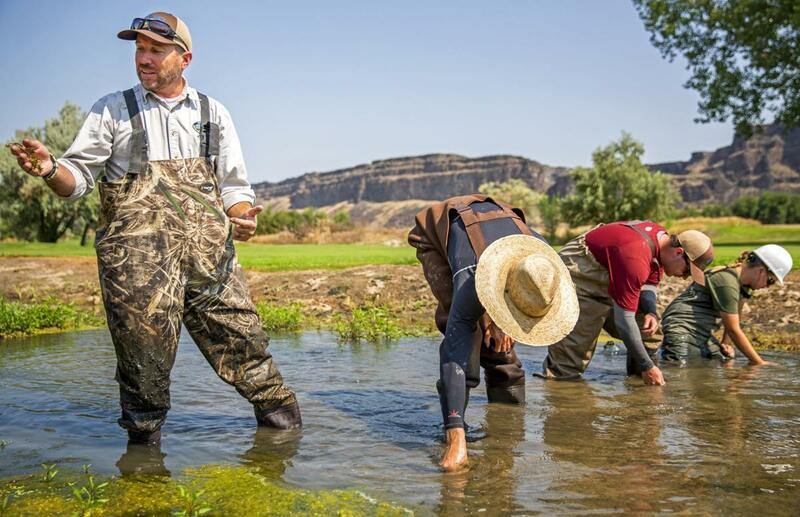 If mussels were to get into the Idaho water system, it could be devastating to agriculture, Twin Falls County Weed Superintendent Kali Sherrill said. Idaho has been trying to keep quagga and zebra mussels out of lakes and reservoirs since 2008. One of the biggest efforts is to prevent invasive mussels from getting into the Columbia Basin. Nicholas Kurfluh, the Idaho Department of Agriculture section manager for invasive species, said Idaho is one of the last states free of invasive quagga and zebra mussels. He said Oregon, Washington, Wyoming and Idaho are some of the last places that have not had mussels invade the water system. So far, during the 2018 boating season, 66,678 boats have been checked and 43 have been mussel-fouled boats. More than 500,000 boat inspections have been conducted in Idaho since 2009, and 218 were found carrying quagga or zebra mussels. Watercraft that are considered “high-risk” to the state of Idaho are boats that have been in mussel-infested states within the past 30 days, show dirt or grime below the waterline or boats that have standing water on board. The first and most effective step is prevention. Prevention starts with inspecting your boat when it leaves the water, using the clean, drain, dry system. Kurfluh said this system should become a habit for anyone who goes boating. Anything that goes in the water is required for a mandatory inspection at one of the inspection stations.